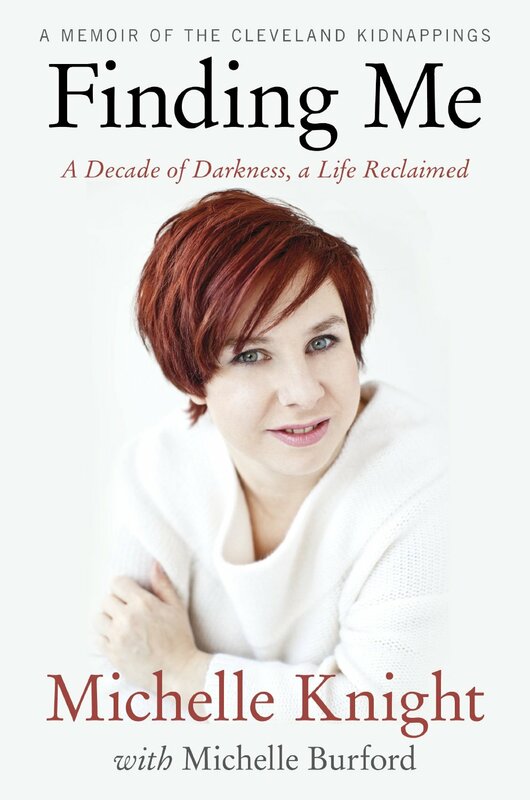 A Life Reclaimed - these three simple words give voice to the heart and soul of Michelle Knight’s memoir, Finding Me: A Decade of Darkness, a Life Reclaimed, written with Michelle Burford. Less than half the book speaks of the horror that she, Amanda Barry and Gina DeJesus faced each day while held in captivity by Ariel Castro, who Knight refers to as "the dude." In concise and clear words that never softens the reality of her experience nor overly dwells on it, she communicates the fear and the pain she knew as her constant companion during her years chained and held captive at the whim of the dude. She held tight to her memories of better times when she cradled her beloved son close, laughing and playing games with him. She emerged from her long night of darkness, eyes burning from the unaccustomed sun’s brightness, as thin and worn as a rag yet with her indomitable spirit in command. She faced the world holding tightly to her hopes and dreams, standing strong and ready to begin her recovered life anew. She opened her arms and embraced her freedom without bitterness. She literally threw off her chains starting over in the spirit of love and gentleness. She held fast to the power of her relentless determination to reclaim her life. Michelle alone of the three captives testified at the trial of her captor. She stated that writing and reading her statement gave her the strength to be stronger, that there is more good in our world than evil and that she will prevail. She writes of how she has chosen to live a life of love and kindness toward all others. She said that if she were to fill herself with hate then the dude would have won. She does wonder why her life turned out as it did. Even before her kidnapping her days were tough, her family neglectful and abuse a horror she knew before her abduction. But, forgiveness is the road to a life reclaimed. What I’m saying is that I deserve to be free. And I can’t have freedom if I’m walking around every day with resentment and bitterness. Forgiveness is the only way I can truly reclaim my life. If I don’t forgive him, then it’ll be like he imprisoned me twice: first while he held me in his house, and now even after he’s gone. I’m letting my hatred of him go so I can truly get my life back. Michelle Knight’s words are a powerful gift to read. She inspires me. I will go back to the final fifteen pages of her book when I want a reminder about a life worth living. The goodness, the power and the strength she embodies comes with her message of letting go of hatred and starting over, reclaiming a life of joy and thankfulness.